KUALA LUMPUR (Dec 22): Datuk Seri Mahmud Abu Bekir Abdul Taib's lawyer today questioned the basis for the businessman's ex-wife, Shahnaz Majid, seeking a RM100 million muta'ah (conciliatory payment) claim. 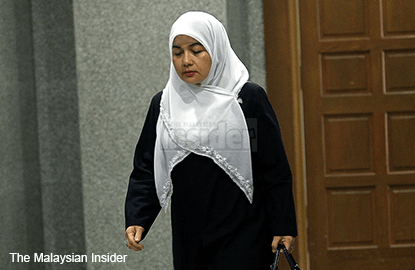 The lawyer, Datuk Seri Zainul Rijal Abu Bakar told the Shariah High Court this was because Shahnaz was the one that had chosen to live separately for 10 years, away from Mahmud Bekir. He said Shahnaz, as a plaintiff, could have filed for divorce once she started living separately in 1999. "Living apart for 10 years is also 'contributory' by the plaintiff herself. He said the plaintiff had instead waited for 10 years and only now had sought conciliatory payment. Zainul also disputed the amount of RM100 million as claimed by Shahnaz. "What is the justification that the RM100 million is fair and in accordance with Islamic law? "The mechanism and method of calculation was not given specifically to the court," he said before Judge Mohammed Abdul Karim Wahab. Shahnaz's lawyer, Akbardin Abdul Kader during trial on November 17, had said that the amount is not strange because Mahmud Bekir is worth between RM916 million and RM1.334 billion. He said Mahmud Bekir's expenses reaches hundreds of thousands of ringgit per month. The judge later set the trial to resume on January 28 next year to hear the response from Shahnaz's lawyer. He also announced that the decision for this case will be presented on March 10. On May 11, 2011, the Shariah High Court confirmed the divorce between Mahmud and Shahnaz. The couple were married on January 9, 1992 and have a son named Raden Murya. The RM100 million conciliatory payment suit by Shahnaz, who is the elder sister of singer Datuk Sheila Majid, has attracted attention as it is expected to expose former Sarawak chief minister Tun Abdul Taib Mahmud's wealth.